and here is the feather at the top! You might recall that I started on this last year; all SiF members received the instructions to a block every month they finished one of their UFOs. Using QAYG I slowly worked my way through them. Eventually I put them all together and started quilting diamonds in the sashing. 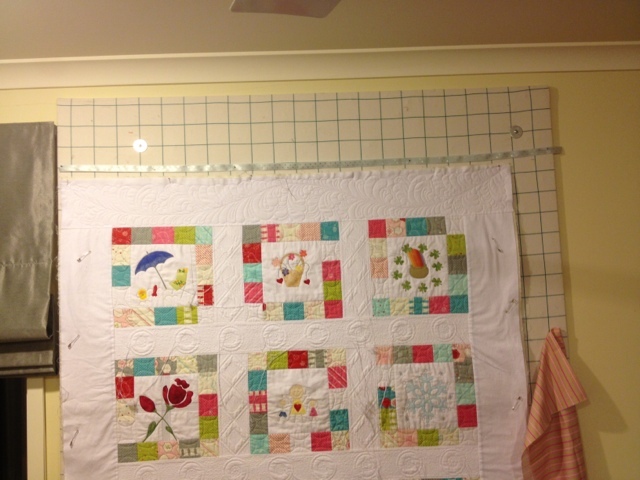 As my vertical sashing didn't line up perfectly I decided to use circles in the horizontal sashing. For both of them I marked the 'straight' lines and then fmqed them (as well as microstipple, pebbles and wavy lines). I had gotten a bit ahead of myself and quilted a big fmq feather up the top, but it did not seem to fit the rest of the rather 'architectural' quilting design so I started unpicking (...) from both sides. When Suz came over on Friday, we decided that I would keep the feather in the middle of the top after all (I am quite proud how it had turned out and it was a $%##*@ hard job to even unpick those 5" on either side!). For some unknown reason I ended up with a little cut in the border bottom left so I ended up appliqueing a few flowers on the border. Last night I had it all put together and while watching TV managed to bury a gazillion thread ends. I have to admit I yet have to finish stitching down three sides of the binding on the back but that will happen tonight and with work starting up again tomorrow who knows when I will get to post next! Finished size is approx 43"x55" and I am mightly proud of it! And just look how many labels this covers... Linking up with Leah Day's FMS Friday Saturday! Otherwise it's the school holidays and today the boys have been little ----- (starts with s, but it's not 'sunshines'!). I have no leave as we have a big overseas trip planned this winter so I am working from home. The weather has been very kind (not that the boys would note much, right now they're watching DVDs). I'll be back with a report from my Melbourne visit soon (I hope)! Mix of Styles - good or bad?! Advice, please!!! iphone-o-gram - apologies for the picture quality in advance! 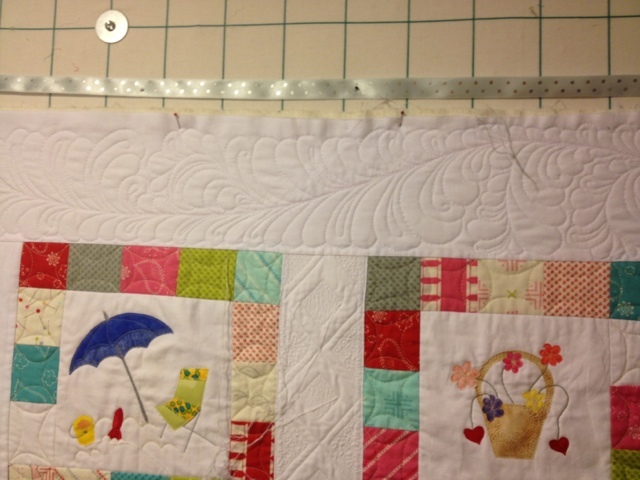 I feel the border needs less dense quilting than the sashings, so I fmqed feathers tonight. It fits the purpose of 'less dense', but does it go with the style of the rest? It would be a right pain in the proverbial to unpick it... Advice, please!!! This is where I am up to so far, two more pairs of vertical sashings and one more horizontal one to go. 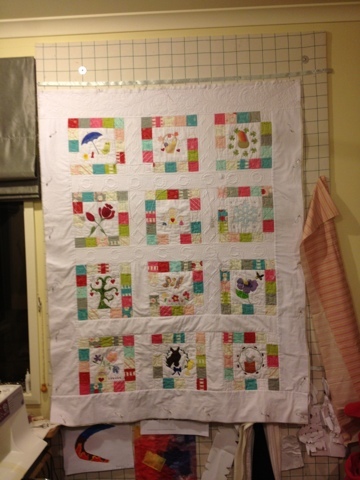 The blocks have no quilting except the stitching for the applique. There's so much stitching in the sashings I don't intend to add any to the blocks, otherwise it will simply get too stiff for a lap quilt. When it's finished I'll see if the blocks look to puffy, I can always block it if it shrinks too much (seems to stay within reason so far even in the block that's completely quilted in above). I have cut everything for the straps and the bag exterior, (just remembered, I still need to go off and find some batting scraps), it's quite a pile! Above you can see my feature fabric (handles, outside pocket lining, feature for outside pockets), then the black denim for the outside (body) and the white drill/duck? for the interlining. I invested in a pack of jeans needles, I'm bound to go through a few! 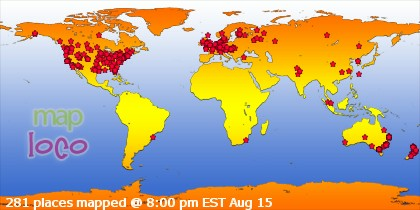 Suz is quite a bit ahead of me, here you can see what she has been up to. Remember, if you feel like getting (any) bag (or two or three) done, just join us through the linky in the Bag Along Page! 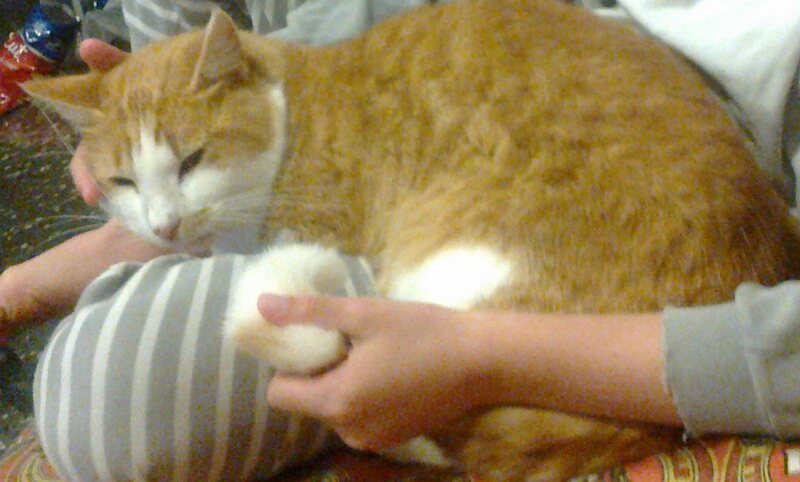 On a sadder note it's bee a week since our lovely cat Tigger has been seen - we miss him!!! While all 4 of our cats roam, he has never been away for that long, and there's lots of things that could happen to cats in the rural areas... I just hope that he has gone on a big adventure and finds his way home soon! Linking up to Leah Day's FMQ Friday (a bit late again, I know!). Happy Sewing! As per yesterday's post, Suz and I have started on a Elizabeth Hartman's Sewing Circle Tote. Why don't you bag along with us? What bag pattern have you always looked at but never completed? Why are bag patterns so complicated anyway? GETTING SEWING DONE: My BoM from last year, "Seasons of" is all in one piece and I have started quilting. I took plenty of pics for a possible QAYG tutorial, it all went so well together, I was very pleased with myself today! approx 43 1/2" x 56"
STARTING SOMETHING NEW: Are you a Bag Lady / Guy? I certainly am, a gal (guy) never has enough bags! Elizabeth Hartman from Oh Fransson! has just released a new bag pattern for her Sewing Circle Tote. Join Suz and I in our little Bag Along to get this finished before the end of June! First, purchase the pattern from her shop here for US$12.50 (I also bought the Margaret Bag pattern and took advantage of the 25% off, an offer that unfortunately just expired). The pattern is as detailed as you would expect from Elizabeth Hartmann. She has a detailed list of materials, so please raid your stash and purchase remainders to join us in completing the outside of the bag before the end of April. I am yet to learn how to do a linky, so if you are keen to join us, please leave a comment to this post including your blog address or email me (check my profile). Linking up to Birthday Love Stash over at Sugarlane Quilts and FMQ Friday over at Leah Day's.